Copious amounts of garbage have been drowning landfills. Forty percent of all lakes in America are too polluted for aquatic life, let alone for swimming in, according to the Nature Conservancy. It falls upon us to prevent the next 60 percent. With no end in sight, it has become an obligation for the newest generations to reduce our pollution rates so future generations can appreciate the standard of living we have now. This doesn’t mean that it’s necessary to sell your car and travel everywhere on a bicycle, but small changes can add up to make a big change. If you’re wondering where to start, look no further: Here are three easy ways to go greener. The easiest way to reduce the amount of waste we create is by not creating it in the first place. This can be as easy as refusing a plastic bag at the store or opting out of using single-use utensils and plastics. Forty percent of all plastic usage comes from single-use products. America’s plastic usage alone creates enough waste to circle the Earth 773 times each year. When it’s time to buy groceries, make sure to throw some tote bags into the car before you leave for the store. Worldwide, more than 1 million bags are used per minute, so this is an easy step to lower that rate. Plastic bags harm wildlife, disrupt and clog sewage systems and ruin the overarching beauty of our planet. Many stores already offer options to buy reusable bags, making this switch easy and simple. Moreover, several cities nationwide have banned plastic bags and charge a fee upon checkout, so reusable bags will also save you money. California was the first state to enact a statewide plastic bag ban, which hopefully will be followed by other states. Another way of reducing plastic is by buying food in bulk which can not only reduce costs for the consumer but also reduce the packaging used. When shopping, try to think long term. If you are going to buy long lasting items, consider spending a little extra money on something that will last longer and in turn create less waste. You will also thank yourself in the long run for not having to spend time and money shopping every other month. Reusable water bottles are a healthy alternative to single use plastic water bottles. Americans alone dispose of 38 billion plastic water bottles every year. If you buy drinks at stores such as Starbucks or Blenders in the Grass, buy one of their reusable cups. Discounts are often given for bringing in your own cup at various chain stores. You will be preventing further damage to the hole in your pocket and the one in our atmosphere. Shopping at thrift stores and buying used clothes are great alternatives to shopping at name brand stores. Clothes that are being sold as “used” are often in good condition and less expensive than name brand clothes. Moreover, countless thrift stores benefit various causes. In Ventura, there is the ARC Foundation Thrift Store, the Coalition Against Household Violence Thrift Store and the Child Abuse and Neglect Thrift Store. You will be preventing further damage to the hole in your pocket and the one in our atmosphere. 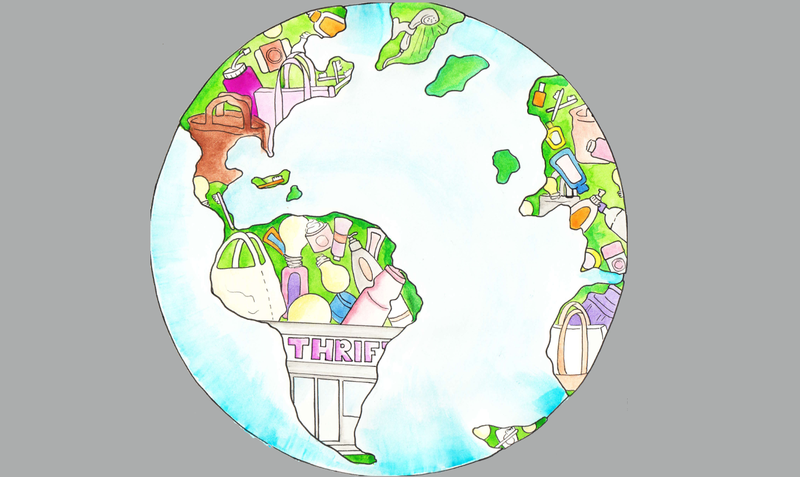 Remember that shopping at thrift stores raises money for charities, reduces waste in our landfills, saves money and supports local businesses. From toilet paper rolls to your parents’ old Fleetwood Mac CDs, there are countless ways to reuse household products that most people never even think about. So burn some brain cells and come up with creative ways to reuse some everyday items. If not, here is another list of ways you can. Replacing products in your life with their greener alternatives will have a major impact on pollution. Personal and home care products can pollute waterways after being washed down drains. When looking for such products, try to buy ones that have fewer ingredients in them and ingredients that are pronounceable. Replacing household necessities like lightbulbs, shower heads and even toothbrushes make the biggest difference. Ditch the tin foil, and grab some reusable Tupperware containers. Ditch the plastic water bottles, and snag some reusable water bottles. Ditch all garbage items, and replace them with pristine worthwhile purchases. Ditch the environmentally irresponsible lifestyle, and commit to the evermore lifestyle of green living.